Mon-Fri 0900–1830, Sat 0900–1700, Sun 1000-1500. The main tourist information office is in the Stadtcasino on Barfüsserplatz, on the edge of the Old Town. A second office is located at the central train station. As well as general tourist information, both offices also offer visitors help with accommodation bookings and tickets. The BaselCard includes reduced entrance rates to the zoo, a free city sightseeing tour and free ferry boat rides. There are also discounts on museum entry, cinema tickets, restaurants and more. The card is available for 24 and 48 hours from tourist information centres, the airport and some hotels. A public home located in parkland in the suburb of Riehen, this art venue was designed by architect Renzo Piano. On display is the amazing collection of Ernst and Hildy Beyeler, containing some 200 contemporary artworks and giving an interesting and personal take on modern art history. Artists represented include Cézanne, Rousseau, Mondrian, Klee, Ernst, Matisse and Bacon. This imposing minster dominates the Old Town with its combination of gothic and romanesque features, red sandstone walls, colourful roof tiles and twin towers. Inside the cathedral is the tomb of one of the greatest of the European Renaissance humanists, Erasmus of Rotterdam. The views from the Pfalz terrace alongside take in the Rhine, the Vosges Mountains, the Black Forest and the Jura. The Rathaus, or City Hall, is a renovated Renaissance palace with a striking red façade and some lively frescoes. Particularly worth seeing are the Council Chambers, the atmospheric Inner Courtyard, the romantic arcades and the imposing tower. The City Hall has been located here since the 14th century. Guided tours are available with the tourist office. The oldest art museum in Switzerland contains the world's largest collection of works by the Holbein family, as well as many works by other Swiss Renaissance artists, and an impressive collection of modern art, from impressionism and cubism to German expressionism and abstract expressionism. The likes of Monet, Van Gogh, Warhol, Picasso and Giacometti all feature. 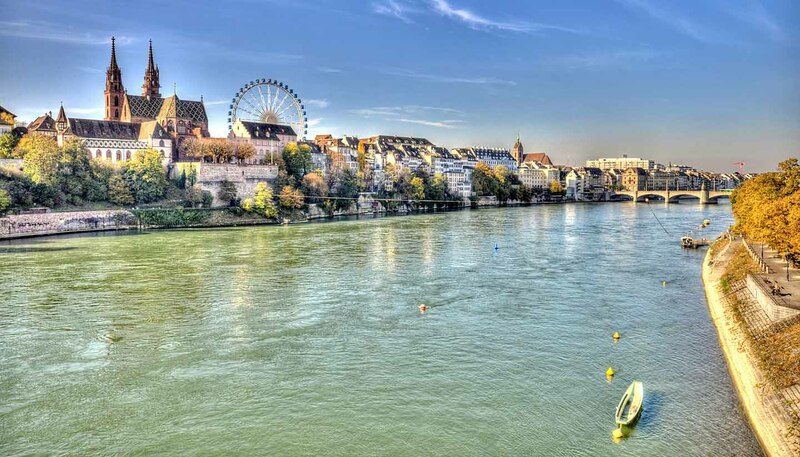 With its glut of bold modern buildings and several internationally renowned architects' offices, it's only fitting that Basel has a world-class architecture museum. It focuses primarily on modern Swiss architecture (including Le Corbusier) and contemporary global architecture, as well as connections between architecture and other arts. Tues, Wed and Fri 1100-1800, Thurs 1100-2030, Sat & Sun 1100-1700. Devoted to the work of local kinetic artist Jean Tinguely (1925-1991), this museum is as unusual as his art, being full of objects that move, rattle, crash and jump. You can see another of his creations, the Tinguely-Brunnen (a fountain with moving sculptures and waterpipes), in the city centre in front of the Stadttheater. Basel's zoo, referred to as 'Zolli' by locals, was established way back in 1874 and remains one of Switzerland's most popular ticketed visitor attractions. Its 6,000 animals (including lions, giraffes, gorillas and kangaroos) attract around a million visitors each year. The zoo has a successful breeding programme. Daily 0800-1730 (Jan-Feb); daily 0800-1800 (Mar-Apr), daily 0800-1830 (May-Aug), daily 0800-1800 (Sept-Oct), daily 0800-1730 (Nov-Dec). This striking Frank Gehry-styled museum presents two major temporary exhibitions each year, related to design, architecture, furniture and lighting. Smaller exhibitions and projects are showcased in other buildings on the Vitra Campus. Guided tours are available, but it's perfectly possible to visit independently. Though easily reached, it's actually located across the border in Germany. Basel's ethnographic museum features exhibits from South America, Africa, East Asia and Oceania. The exhibits from the South Seas, Ancient America, Tibet and Bali are rightly renowned, as are its textiles. It was originally started 150 years by private collectors and has gradually expanded over time. Tues-Sun 1000-1700. First Wed of the month 1000-2000. Housed in a medieval paper mill, this museum traces the development of paper, writing, printing and bookbinding. Paper is still made here using the old devices and machines on display, and visitors are encouraged to make their own. Absorb the unique atmosphere from the hammering of the stamp machine to the smell of fresh printer's ink. Telephone: +41 61 225 9090. Tues-Fri and Sun 1100-1700, Sat 1300-1700.